this is the dog companion-book to I Could Pee on This: And Other Poems by Catswhich i have reviewed herethis is roughly the same kind of thing, where dogs finally get a chance to express themselves through poetry, with accompanying photos. i have reprinted a few of my favorites, with my own accompanying photos. by which i mean, i grabbed 'em from les internets.time to enjoy!! !DOORBELLTHAT WAS THE DOORBELL!SOMEONE RANG THE DOORBELL!SOMEONE'S AT THE DOOR!I CAN HEAR THEM AT THE DOOR!I CAN'T WAIT TO SEE WHO'S AT THE DOOR!OH PLEASE LET ME SEE WHO'S AT THE DOOR!WHY ARE YOU TAKING MEAWAY FROM THE DOOR? !WHY AM I BEING PUT IN THIS ROOMAWAY FROM THE DOOR? !OH, MAGICAL, MYSTERIOUS PERSONWHO RINGS OUR DOORBELL!ONE DAY WE SHALL MEET!SympathyI'm not expectingAny sympathyI'm not askingFor any pityI'm not seekingAny condolencesI'm not hopingFor any sorrowBut that giant roastYou were going to have for your partyBefore I just ate itStill isn't sitting right in my bellySo maybe I am expectingA small sense of gratitudeFor saving you from this pain.Another BagLoveTrue, unbridled loveIs looking at what I just didOn the sidewalkAnd then picking it up in a bagI can only imagine as a treasured keepsakeWow, the collection you must have by nowWingmanI wag my tailI tilt my headI give a little winkI flash a smileI show my bellyI give a little lickI do it allFrom sit to speakTo attract women far and nearThen you chime inWith something about "fan fiction"And I realize we're going to die aloneAnd Then Our Eyes LockAnd then our eyes lockAnd then the world stopsAnd then I realizeMan, I'm really wrapped around your legMan, I'm really going to townMan, I'm clearly not stoppingSo believe me when I sayOur next twenty minutes togetherWill be the most awkward of my entire lifeSitYou want me to sit?You'd like me to sit?You need me to sit?You're asking me to sit?You're saying louder for me to sit?You're yelling for me to sit?You're begging for me to sit?You're pleading for me to sitYou say the word "sit" Like I have any clue what it meansBut I love your enthusiasmAnd so I jump up and down with joyfor the both of usThe NamingGIve me something strongGive me something powerfulGive me something nobleGive me something memorableGive me somethingTo carry through all my yearsWith back straight and chin held highBut then you ask your three-year-old daughter"Why don't you name the new puppy? "And I'm so screwed that I could cry.Date NightEvery time I watchLady and the TrampI think"SHE'S HAVING SOME OF YOUR PASTA!""QUICK! EAT IT ALL! EAT IT ALL NOW!!!""GROWL! BARE YOUR TEETH! DO SOMETHING! ""OH, DON'T GIVE HER THE MEATBALL!THERE'S MEAT IN IT!""IDIOT! "But then againI'm not the romantic type.enjoy the book, dog lovers!!! After the awesome book that enlightened me about cats' behavior and intentions, I Could Pee on This: And Other Poems by Cats (that I reviewed here), I had to read this one. I had dogs and cats, and I love them equally. I mean, there are some prejudices about dogs being dumber than cats, supported by media everywhere.But I don't believe that, really...Anyway, lovely book of poems. It has four chapters that help you to understand your furry friend, a little bit more. There are some insightful points of view here. They have feelings too, you know. For example, if you're about to give them some food, don't stop to do your stuff, feed them first. You already showed them the can/bag of food. THEY KNOW. Don't make them feel this way:Dance of JoyThis is the dance I do for you, do for youThis is the dance I do for youAs you get my can of foodThis is the twirl I do for you, do for youThis is the twirl I do for youAs you open my can of foodThis is the leap I do for you, do for youThis is the eight-foot vertical leapI do for youAs you stop serving my food to answerthe phoneThis is me running in a sheer panic,wild panicThis is me running in desperate,gasping, blind panicAs you continue to talk on the phone...… THIS IS ME LOSING MY [censored] MINDMY [censored] BRAINS, MY [censored] COOLTHIS IS ME WONDERING WHAT THE [censored]COULD BE SO [censored] IMPORTANTTHAT YOU’RE STILL ON THE [censored] PHONEThis is me realizing I was howling out loud,really loudAnd that perhaps I overreactedjust a littleAnd so this is me eating the foodyou give to me, always give to meTouching. There are little gems all over this book:Where Are You?! ?I was so worriedI was so scaredI thought that I had lost youAnd the life that we both sharedI searched through the entire houseFrom the basement to the atticThe living, dining, and bedroomsEven the trash cans, because I was franticUp and down the staircaseBack and forth across the hallsIn and out through every doorLouder and louder were my callsI had given up every hopeI had given in to despairI had given the bad news to the pet catWho gave me a look before re-licking her hairBut just when all seemed lost, I found youAnd it gave my heart a rushTo see you sitting—startled, but alive and wellSo if you don’t mind,I’ll just stay here until you flushThe desperate sense of loss in this poem is overwhelming. You can only imagine this dog's smile when its owner was found.I Dropped a BallI dropped a ball in your lapIt’s time to playI just put a ball in your lapSo it’s time to playSee that ball I placed in your lap?That means it’s time to playYou can have your emergency appendectomyAny other dayBut I dropped a ball in your lapAnd now it’s time to playYes dog, people should know their priorities!WingmanI wag my tailI tilt my headI give a little winkI flash my smileI show my bellyI give a little lickI do it allFrom sit to speakTo attract women far and nearThen you chime inWith something about “fan fiction”And I realize we’re going to die aloneLassieHow comeWith just a few barksEveryone can understandThat Lassie is sayingTimmy fell down the wellBut with my endless whining and gnawingYou can’t understandThat I am sayingI’d rather the earth swallowed me wholeThan go out in public wearing this raincoatI loved this book. Happy reading!Nov 17, 13* Also on my blog. ** Photo credit: Sign dog and cat via PinterestThe rest of the photos from I Could Chew on This: And Other Poems by Dogs by Francesco Marciuliano. 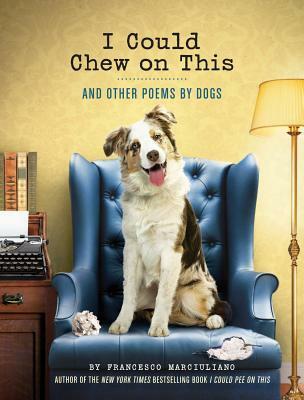 This is a totally adorable collection of poems told from a dog's perspective. The poems are short but have a loaded punch. Also the photos with each poem are just perfect. I couldn't help but smile more than a few times reading such poems as 'Unleashed':I'm freeI'm freeI'm freeI'm freeI'm freeI'm freeI'm lost.Just perfect! BARK! BARK! bark BARK bArKoh Sorry was leaving a review in dog dialect. This had me laughing and I'm not even a dog lover. Taken from book: "Special Word"There's a special wordWe dogs haveTo express our great pleasureUpon seeking out favorite personIt's "bark"but be carefulFor "bark"Also means 742,000 other thingsSo it's all really about the context. I must admit, I am a cat person, I understand them better than I do dogs, but at the same time cats are still a bewildering mystery to me. I do have a little dog friend, Bert, whom I adore. So to better understand the mind of a dog and maybe even Bert I had to read this book full of dog written poetry, and I am impressed.Dogs are deep and complex thinkers but due to their good humor and loyal nature, they at times can come across as simple minded. While cats can be vengeful and full of spite and they do do "revenge" peeing among other spiteful things, and don't let that hipster douchebag Jackson Galaxy tell you otherwise, dogs are not. After reading musings on tail wagging, forced breath smelling and boisterous behavior, I've come to the conclusion that my little cat Molly was born with a dog's brain. She exhibits these behaviors and she even makes a barking noise from time to time. So thank you to all of the dogs who participated in the making of this book, I now have a better understanding of Molly and of why she wags her tail so damn much. Very sweet collection of poems "written" by insightful dogs. Made me smile. Loved it! Super fast read, super cute, and the whole time you'll be nudging whoever is near you and telling them about how that's what your dog does too! Received this on Christmas morning and had the best time reading it out loud. Although some of the poems were serious, and frankly, out of place, most were light-hearted. Many had us rolling with laughter! Fun and imaginative look at life from a dog's point of view. This book caught my attention since who wouldn't mind to hear poetry from the mind of a puppy-dog since we don't seem to credit them with so much besides slavish obedience and unlimited love that looks past our worst selves. Furthermore if we aren't catering to those particular thoughts than we are giving them very little credit with the terrible language that so many find worthwhile to give animals in the modern day memes. Fortunately for dog-lovers this is one book that you will enjoy and want to keep close to you for showing off. Our canine children have been given a true blessing by the author in recognizing and talking in real talk instead of the garbled mess while also being given a chance to openly express themselves with more than a wag of their little tails or in the case of tailless breeds their whole back side. In my experience it was better to read the book aloud, especially as there was no one around. The voice of the dog came naturally to me as I read and more so as I tried to add a bit of movement or change the volume of my voice to reflect the writing. There is truly no pleasure in being able to give dogs even more of a voice as you read what may be considered their thoughts since they are so varied and different in their approaches to life just like humans. There were photographs that were included of various different dogs relating to the poem that they were opposite of. And it helped for the reader to be able to match the dog with not only the poem but also the tone that was meant to be read. Truly a doggy gem to be cherished and enjoyed although I am sure your pet pooch may roll his or her eyes while taking the time to either bring over their favorite toy to play or collapse on you in a bid for love. I really liked the concept of the book but the execution left a lot to be desired. The poems overall were low in quality and probably only took mere moments to put together each one. Another issue I had was while I have had dogs all of my life, I suppose I do not anthropomorphize in the same way the author does. I hold my dogs to higher standards than the author appears to, honestly. (Although my one less intelligent dog did ring more true for the book.) I did, however, laugh a few times and loved the photos of the dogs. There just isn't really much to say about these books, although I would recommend borrowing rather than buying. Such a good read for any dog owner..or a person who's thinking of getting a dog. Each page has a poem, from the dog's point of view, and a picture that fits. It's a small book is size, but lots of humor. From "I lost My Mind When You Leave the House", to "The Cone" and then to "I Could Chew on This", I loved them all. My favorite, maybe because I've already memorized it, is:"Unleashed". Read the book. I'm a HUGE dog lover and picked this book because of the cover, and I'm so very glad I did! Even though it was a quick read, I though it was fun and heartwarming. Every single dog I've ever had, or known through other family members and friends was in this book. I would definitely recommend this book to anyone who loves dogs. Short and sweet, but fun way to start the new reading year. Sure, they were not epic poems, but sometimes life is simple. Most people loved and enjoyed it, read a few reviewers thinking the poems were flat. Those people should get over themselves and have some fun! This is a book of poems written by dogs ... absolutely hilarious. A quick and easy read, and something to lift your spirits when you are down. And if you own dogs, you'll recognize all of these characteristics. Very fun read. Fun poetry book for dog lovers. If you have a dog you will love this. The poems are spot on. Hilarious book of poetry from the dog's perspective, written by the same guy who wrote I Could Pee on This : And Other Poems by Cats. Read 'em both and weep...with laughter. Freakin adorable. You can't go wrong with a book of pictures of dogs and puppies (oh and some cute poems too). You just can't. Finally, dogs get the chance to express themselves in poetry. Here's one of my favorites:TimeWhere did you go? !Where have you been? !Do you know how long you've been gone? !Three hours!Or fifteen minutes Or six monthsThe point isI've been waiting at that doorFor eighteen straight yearsAnd every one of those twelve seconds killed meCute. Thought it'd be cuter. The cat poems got more actual laughs and chuckles from me. This one barely cracked a smile. And yes I am a cat AND a dog lover. I don't believe in a vs when it comes to them. This book was very cute and I loved the photos. My favorite poem was Next Car Over. As a dog owner, I related to many of these poems. I found this book to be adorable and funny. Some of these poems were pretty funny ... all of them were relatable. I want all of the dogs. This book was exactly what I needed-funny and charming! It's poetry purportedly written by dogs, and it really works-it had me laughing out loud. Loved reading this book of poems written from a dog's perspective. The dog pictures are beautiful. This book is a great for a gift or a quick relatable read. The second star is because a few of the poems did actually make me chuckle a little bit. The rest, though, just didn't work for me. I just didn't like the voice of the author. Francesco Marciuliano - Francesco MarciulianoPens the comic strips Sally Forth and Medium Large. Has written for the Onion News Network, Smosh, McSweeney’s, and had a play produced at the New York International Fringe Festival. Served as head writer for the PBS series SeeMore's Playhouse (for which his script won two regional Emmys). Was afraid of the color yellow until about age nine. Tans a little too well to be trusted by security.